But in a great house there are not only vessels of gold and of silver, but also of wood and of earth; and some to honour, and some to dishonour. If a man therefore purge himself from these, he shall be a vessel unto honour, sanctified, and meet for the master's use, and prepared unto every good work. Flee also youthful lusts: but follow righteousness, faith, charity, peace, with them that call on the Lord out of a pure heart. But foolish and unlearned questions avoid, knowing that they do gender strifes. And the servant of the Lord must not strive; but be gentle unto all men, apt to teach, patient, In meekness instructing those that oppose themselves; if God peradventure will give them repentance to the acknowledging of the truth; And that they may recover themselves out of the snare of the devil, who are taken captive by him at his will. And when he was come nigh, even now at the descent of the mount of Olives, the whole multitude of the disciples began to rejoice and praise God with a loud voice for all the mighty works that they had seen; Saying, Blessed be the King that cometh in the name of the Lord: peace in heaven, and glory in the highest. And some of the Pharisees from among the multitude said unto him, Master, rebuke thy disciples. And he answered and said unto them, I tell you that, if these should hold their peace, the stones would immediately cry out. And when he was come near, he beheld the city, and wept over it, Saying, If thou hadst known, even thou, at least in this thy day, the things which belong unto thy peace! but now they are hid from thine eyes. For the days shall come upon thee, that thine enemies shall cast a trench about thee, and compass thee round, and keep thee in on every side, And shall lay thee even with the ground, and thy children within thee; and they shall not leave in thee one stone upon another; because thou knewest not the time of thy visitation. O Prophet Nahum, thou didst shine forth in the Law/ and proclaim the consolation of grace from of old in the Spirit./ Even so, by appearing unto men,/ God the Word gladdened mortal nature./ Intercede with the compassionate Trinity to grant us His great mercy. From the wealth of God-like faith/ thou didst distribute thy riches to the poor, O Philaret;/ thy life was adorned with compassion/ and thou didst glorify the Giver of Mercy./ Beseech Him to have compassion and to be merciful to those who praise thee. Illumined by the Spirit, thy pure heart was a vessel of illustrious prophecy./ For thou seest the far-off things as though they were present, O Prophet Nahum./ Wherefore we venerate thee. 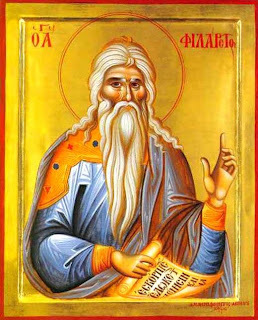 Thou didst possess the spirit of Job in temptations,/ and compassionately distribute thy wealth to the poor./ Thou wast a living fountain of almsgiving/ and by thy manner of life thou dost gladden those who cry:/ O Philaret servant of Christ, rejoice.